The TOA Indoor/Outdoor Box Speakers shall be a two-way bass reflex enclosure suitable for wall mounting. The low-frequency component shall be a 8” (20 cm) cone-type woofer. The high frequency component shall be a 1” (25 mm) dome tweeter. The speaker shall include a transformer having multiple taps (1.5W, 7.5W, 15W, 30W, 60W at 70.7 V and 3W, 15W, 30W, 60W at 100 V) adjustable via the rear of the enclosure. The output sound pressure level at a distance of 1m with 1w input level applied shall be 92 dB SPL and 93 dB SPL using the horn adapter. The rated power handling shall be 60 W continuous pink noise and 180 W continuous program. 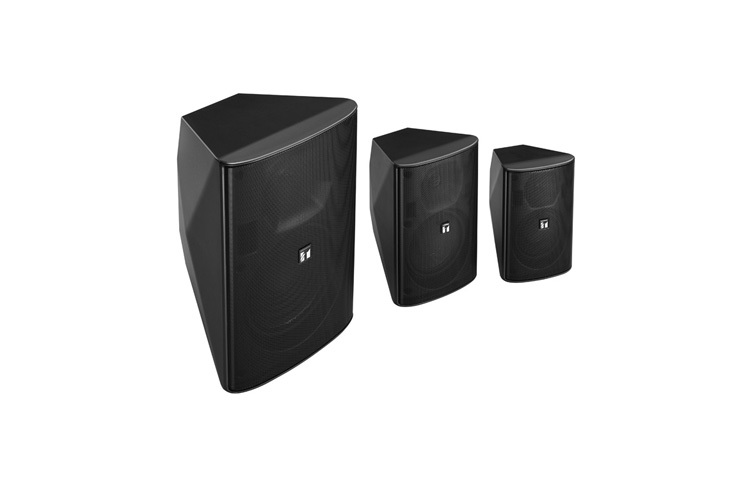 The speaker shall have a frequency response of 65 – 20 kHz. The speaker enclosure shall be constructed of HIPS resin. The speaker shall have an IEC 529 splash-proof rating of IP-X4. The speaker shall have an operating temperature of 14º F to 122º F (-10º C to +50º C). The speaker shall be available in white or black. The grille shall be a punch net, surface-treated steel plate, black with anticorrosive paint. The joint bracket and wall bracket shall be stainless steel. The speaker bracket shall be die-cast aluminum.